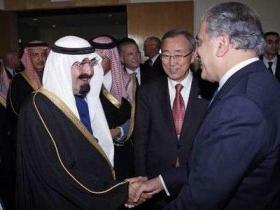 November 12-13, 2008 - The two-day Nov. 12-13, 2008 “Culture of Peace” gathering convened on the initiative of King Abdullah of Saudi Arabia, who called for mutual understanding through dialogue among various faiths, cultures, and civilizations. King Abdullah, who in an opening speech on Wednesday denounced terrorism as the enemy of all religions, initiated the meeting attended by leaders and diplomats from over 70 countries. The meeting reaffirmed the purposes and principles enshrined in the Charter of the United Nations and in the Universal Declaration of Human Rights. The meeting further recalled that all States pledge themselves under the Charter to promote respect for human rights and fundamental freedoms for all, including freedoms of belief and expression. King Abdullah’s initiative has come at a time when the need for dialogue among religions, cultures and civilizations has never been greater. The event brought together people who might not otherwise have had a chance to interact. Along with other initiatives, the meeting will contribute to building a more harmonious world.